Buddhism spread to Bulgaria in the early 1990s, following the collapse of communism and a visit by His Holiness the Dalai Lama in 1991. Since then, communities of several Tibetan Buddhist traditions have been established in Bulgaria, some of which have survived until today. One of those communities is the Bon-Dzogchen Sangha Bulgaria, which follows the Bon Buddhist tradition—recognized by the Dalai Lama as the fifth school of Tibetan Buddhism. We can distinguish three strands of the Bon tradition: old Bon (closely related to shamanism), Yungdrung (eternal Bon), and New Bon (reformed Bon). The Bon-Dzogchen Sangha in Bulgaria is guided by the famous Bon master Geshe Tenzin Wangyal Rinpoche. His disciple, Geshe Khorden Lhundup Gyaltsen, visited Sofia in 2015, 2016, and 2017 to give teachings on Tibetan yoga, Dzogchen, and Phowa (related to the transfer of consciousness during death). In April, during his third visit, I had an opportunity to interview Geshe Lhundup and discuss with him different aspects of the development of Buddhism in the West. Geshe Lhundup was born in 1976, in the village of Damranji, in the traditional Kham region of eastern Tibet. When he was about 12 years old he decided to become a monk and went to Patsang Monastery of the Yungdrung Bon tradition. In 1993, he escaped Tibet for Nepal, where he met Yongdzin Tenzin Namdak Rinpoche in Kathmandu, who was at that time the most senior teacher in the Bon tradition. Rinpoche encouraged him to go to Menri Monastery in India to study for a Geshe degree (an academic degree for monastics equivalent to a doctorate in Buddhist philosophy in the Gelug, Sakya, and Bon schools). Geshe Lhundup lectures at Sofia University “St. Menri Monastery was first established in Tibet in 1405 by Nyammey Sherab Gyeltsen (1356–1416) and quickly became the main monastery of the Bon tradition. Menri, means “Medicine Mountain,” and is derived from the belief that the surrounding mountains are home to hundreds of species of medicinal plants and springs. The Indian branch of the monastery is located in Dolanji, in the Solan District of Himachal Prades, and has more than 350 residents. It is comprised of various Tibetan-style buildings, including temples, a library, a Bon dialectic school, dormitories, a health center, and a nunnery. The head lama of Menri Monastery is His Holiness Lungtok Tenpai Nyima, the 33rd Menri Trizin, who is recognized worldwide as the spiritual leader of the Bon tradition. Geshe Lhundup studied at Menri Monastery from 1993–2009, completing courses on sutra, tantra, and Dzogchen, as well as Tibetan grammar, poetry, astrology, medicine, mandala painting, yoga, and meditation. After 15 years of intensive study, he received his Geshe degree then traveled to Dharamsala to study English. In 2010, he moved to France at the request of Geshe Tenzin Wangyal Rinpoche to support his students there. Until 2017, Geshe Lhundup was the resident lama of Ligmincha France, a branch of Ligmincha International—a worldwide network of Bon centers founded by Tenzin Wangyal Rinpoche. The aim of Ligmincha International is to preserve the ancient teachings, transmissions, and practices of the Bon Buddhist tradition, and to introduce them to the Western world in an authentic manner. They aim to do this in such a way that these teachings, transmissions, and practices remain beneficial when integrated into modern Western culture. 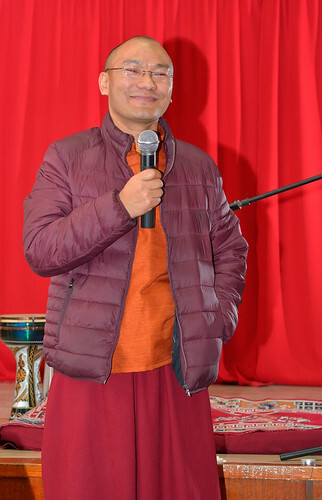 Geshe Lhundup has witnessed many positive changes among his Western students after they have connected with the Dharma. The practice that helped him to change his inner self most profoundly is Dzogchen meditation. Regarding meditation, he advises that quality is more important than quantity and length of the practice.